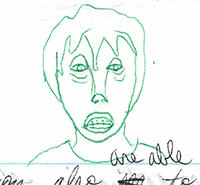 I have made a point of never including in these posts any cruel caricatures of my classmates that I've found in my old high school notebooks. And, yes, I have found several. But even though I disliked a few certain people for whatever reason all those years ago, a lot of them were and are still my friends, and I want bygones to stay bygones. Dude seriously needs some coffee. Check out bean-head over on the left. Is that supposed to be a kerchief? 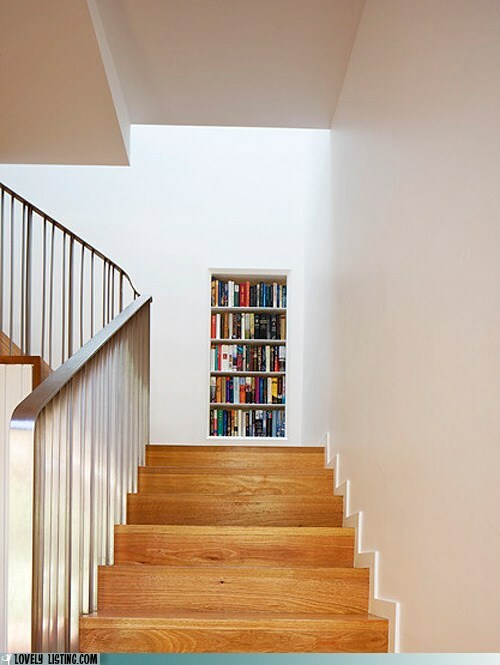 The site Lovely Listing features a bookcase of the day, and today's is titled "Limited Selection." The site asked, "If you could only choose a couple dozen books to keep, what would be at the top of your list?" Faced with having to pare down my large collection, my first inclination is to keep the books that mean the most to me. That is, the physical books which hold some special meaning and can't, for me, be replaced by an ebook or a library copy. The next group of books I'd keep would be the ones that need the printed page and just don't work as well electronically. Finally, I'd have to keep all the rare and out-of-print books. It's a good thing I do have more space than the little bookshelf in the picture, because I don't think everything I'd want to keep would fit there. But making this list has helped me think of a lot of books I can easily get rid of. And by "get rid of" I mean "take to the used book store," where I can turn them in toward credit on more books! My friend Rian recently posted a picture of a treehouse on Facebook. He wrote, "I would LOVE to live in a house that was built/grown like this. I wouldn't ever have to sweep the floors if I didn't feel like it. 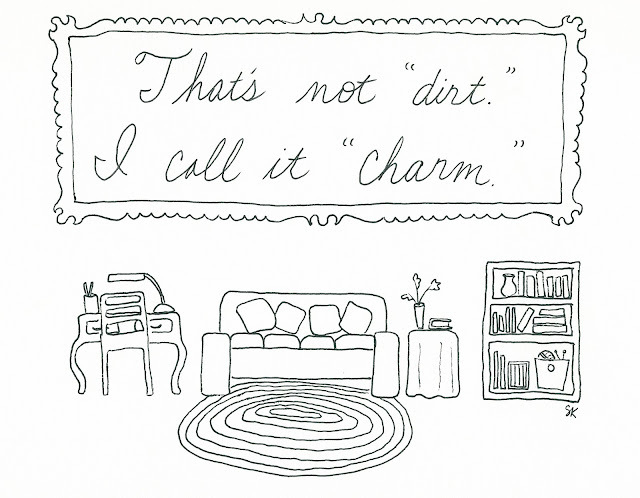 I'd just be like, "That's not dirt; it's called 'charm.'" But, there's no dirt in that picture, you argue. Yes, you're right. You get to add the dirt yourself! 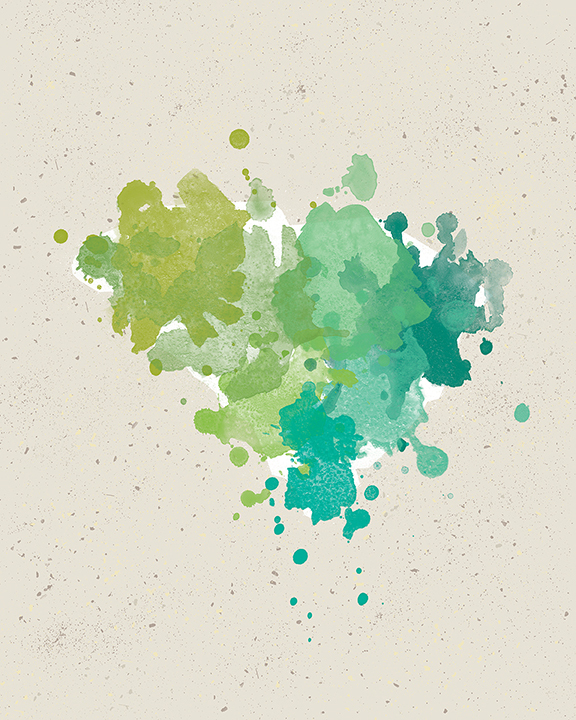 I used some grunge brushes in Photoshop, but you could print it out and step on it, let the dog play with it, give it to your toddler, etc. 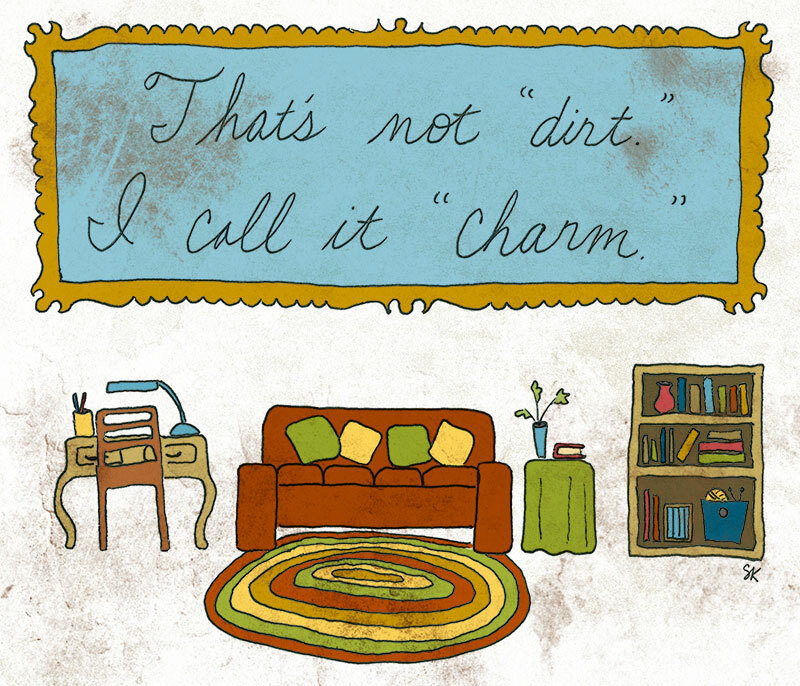 Now it's a beautiful sign to let folks know that you're not a poor housekeeper, you're just exceptionally charming! 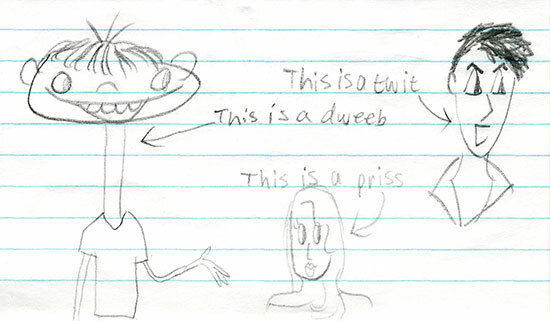 Yet another from my freshman Latin notebook. Ah, how teenagers love to categorize. Because it's important to know the difference. Calling a twit a priss is a major faux pas. People used to constantly tell Anson that he looked like Christian Slater. This year, they're both starring in shows set in 19th century America, "Hell on Wheels" and "Bad Blood: The Hatfields and McCoys," respectively. Since we're a little more than halfway through 2012, it seems like a good time to revisit my New Year's Resolutions. I have not done a great job of keeping all of them, but I've done better with some than with others. In particular, I've done really well with resolution #2: To buy only used clothing (excepting shoes and underwear and socks). 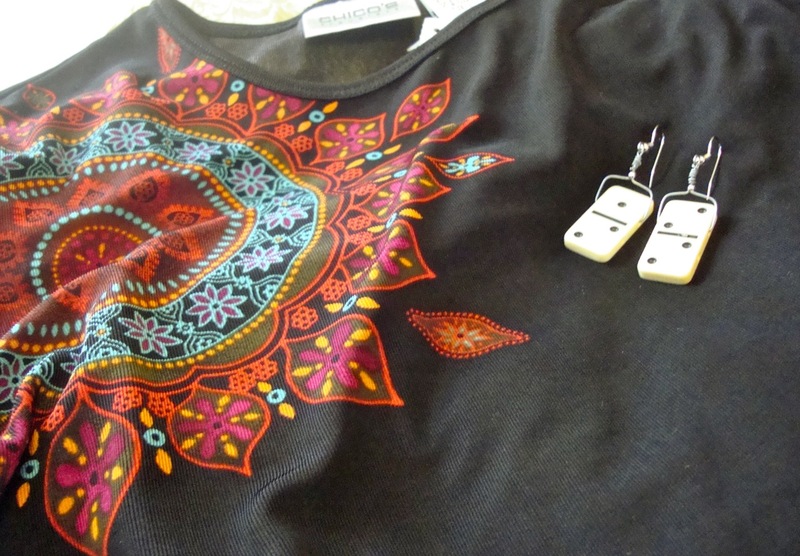 I've managed to actually do this for six months, with the exception of a white t-shirt I bought recently from White House | Black Market because I couldn't find a good plain white tee in any of the consignment or thrift stores. I expected that this resolution would help me save money, but what I didn't anticipate was how it would help free up time and mindshare. When a clothing catalog comes in the mail now, I just put it straight into the recycle bin because I know I'm not going to be buying anything in it. I used to spend time flipping through those catalogs even if I knew it was unlikely that I'd buy anything. And then if I liked something, I'd agonize about whether or not to buy it, which meant keeping the catalog around. No longer. Ad circulars and catalogs all go straight to the bin. I also don't have to think very hard about where to shop if I need something. If I need something for work or a special occasion, I go to Return Engagement or Upscale Resale. If I need jeans or basic casual weekend clothes, it's Goodwill or Salvation Army. I automatically delete any promo emails I get from online retailers and don't waste time browsing through online shopping sites. My resolution has narrowed down the number of choices for me so making a decision takes very little time. Since I'm not fantasizing about which clothes to buy or which stores I might like to shop in, I've noticed that a little piece of my mind is now free to think about other more important things. Now I wonder what other decisions I can make to help get rid of the mental and physical clutter in my life. 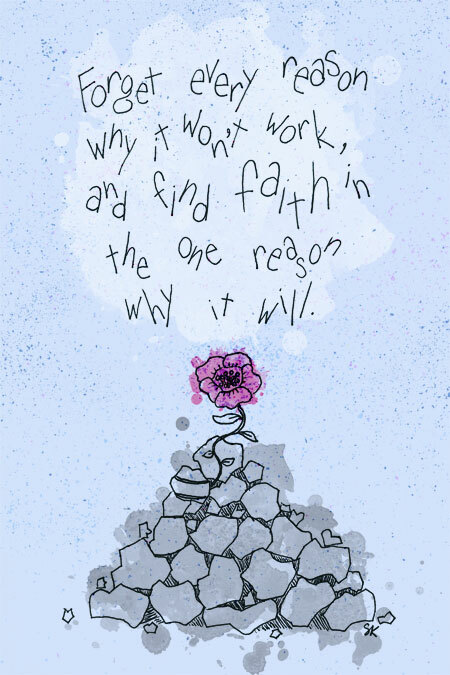 A few days ago, Aron Shea Placencia posted a quote on Facebook that read, "Forget every reason why it won't work, and find faith in the one reason why it will." 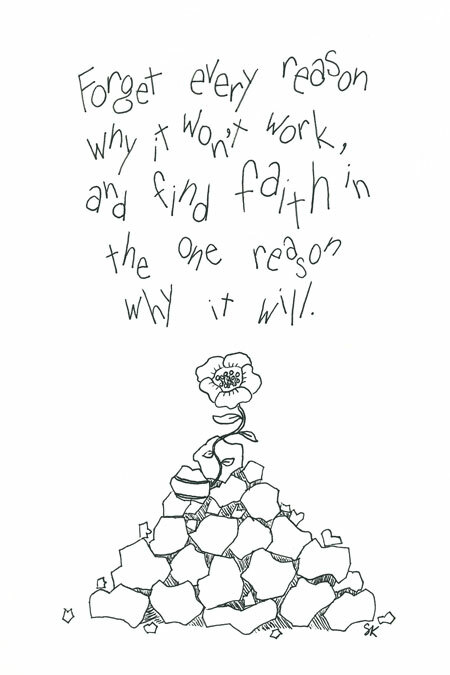 I liked the wording and the sentiment and thought it might make a good coloring page. Click to download high-resolution version. 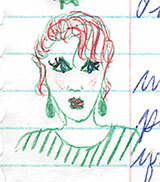 Here's an example of this drawing colored in. I recently downloaded some new Photoshop brushes (the free sample set from PsDefaults) and thought this would be a good chance to play with them. As always, if you do something interesting and creative with one of my drawings, please send me a link. I'd love to see it! 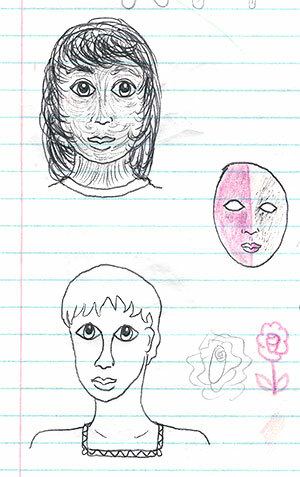 More doodles from my freshman Latin notebook. I tried to blow these up big enough that you can see what they're supposed to be. Let this be a lesson to you: do not leave your bunneh out in the rain. wear, the best in late-80's fashion. Today, the time when many different people came together to form one nation seems hopelessly far in the past. Americans value individuality above togetherness, stubbornness above compromise. 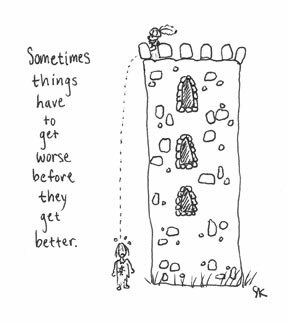 We're encouraged to retreat into our little individual castles and take care of our own problems by ourselves. We don't know our neighbors. We don't participate in our communities or our government. Today, on the day we celebrate our nation's birthday, I invite you to imagine a different United States; the country of our past, and - hopefully - of our future. Imagine a country where people know their neighbors instead of fearing them. Imagine a town, a county, a state, where people are involved with their government and don't let themselves be hoodwinked by crooked politicians. Above all, imagine setting aside our differences - differences of opinion, race, class, geography, and heritage - and working together to ensure life, liberty, and the pursuit of happiness for all Americans. Imagine setting aside our selfish individual desires and pledging to each other our lives, our fortunes, and our sacred honor. We are diverse. We are many, but we can still come together to show that we are one nation. It's not too late. 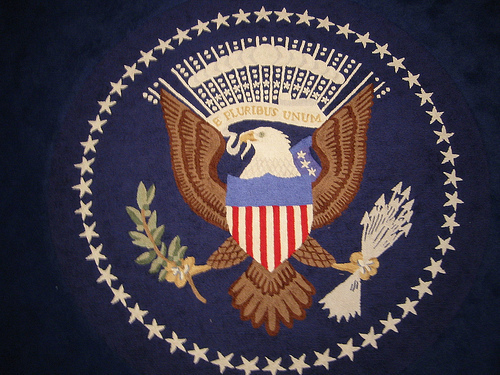 E Pluribus Unum. I try to always carry a sketch book with me wherever I go, so I have something productive to do if I'm stuck waiting somewhere. 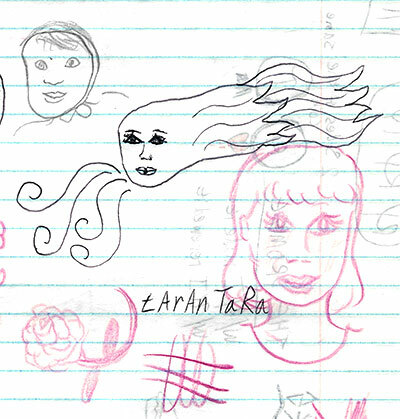 This past Saturday, I needed to stick around the karate studio while my son attended a make-up lesson, so I had some time for serious doodling. 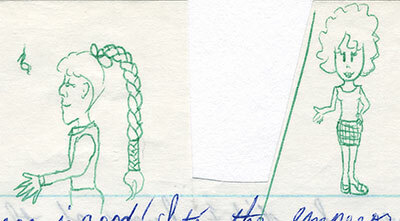 I was going to just scan and post the doodles as "look at this nifty thing" pieces, but then it occurred to me how much I enjoy coloring in my creations in Photoshop and I thought that others might enjoy it, too. So here you have it: Three "Grownup Coloring Pages" that you can download, print, and color in, either with graphics software or the real-life artistic medium of your choice (crayons, pencils, etc.). 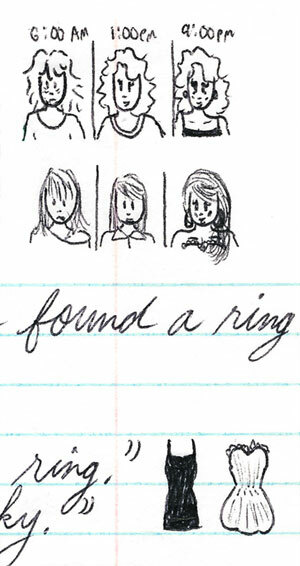 The images are kind of small since they were not originally intended to be more than doodles, and I wasn't using the best pen to draw them, but they are high resolution and should still print out nicely. Like it says on the left, these images are released under a Creative Commons Attribution Non-Commercial license, so you are free to print them, copy them, share them, post them on your own blog, pin them, etc. as long as you 1) give me credit (leaving the little SK in the corner is fine, a link back would be awesome) and 2) don't try and sell them. And if you are particularly proud of your coloring job, please send me a picture! I would love to see your creativity at work. Click on the thumbnail for a link to the high-res image. 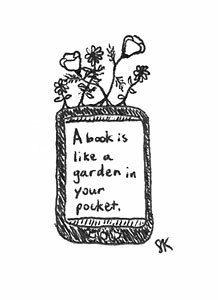 "A book is like a garden in your pocket." 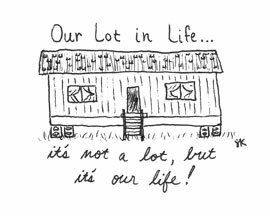 2" x 2.75"
"Our lot in life... it's not a lot, but it's our life!" 3" x 3.5"
"Sometimes things have to get worse before they get better." 4" x 4.5"